For Canadians jumping into online blackjack for the first time, it's quite easy to be overwhelmed with all the terminology and options because of the excess of information available. Even experienced online players are constantly trying to get fresh information on the latest games, bonuses and gambling trends. The goal for players new and old is simple – to win more money and increase that bankroll. We understand that finding relevant information can be difficult, so we've put together this FAQ guide to answer your commonly asked questions about playing at an online casino. According to many different sources, it appears that winnings from an online casino are not subject to taxes in Canada. Because of laws stating that in Canada, winning a lottery prize or winning via a game of chance is not subject to Canadian income tax, players are not required to report their earnings. While blackjack is not a game of pure chance, it's distinctly in a different category from poker because there is a mathematically proven house edge. For more information, it is recommended that you talk to a tax attorney. What Varieties of Blackjack Can I Play Online? There are online casinos with dozens of different variations of blackjack games. Some of the most popular include Spanish 21, Double Exposure Blackjack and Blackjack Switch. Of those three, Spanish 21 is the most popular variant of the traditional form of 21, due to the fact that anytime a player gets to 21, they automatically win. Blackjack Switch is also wildly popular, because players are dealt two hands instead of one and are allowed to switch cards in their hand prior to being asked to hit or stand. Casinos typically have an entire section of their site software dedicated to various blackjack games. Rules for these variants of blackjack are typically available via a link at the tables. Absolutely! There are a number of ways, regardless of your mobile device, to play online blackjack for real money. Some casinos have native apps for real money available for download. Android devices have the best chance of having a native app available because of the open architecture of the operating system. Casinos are freely able to build a mobile client and distribute it as they see fit. For iOS users, Apple has recently starting allowing real money casino apps within the App Store for Canadians. In the next six months the number of real money gaming apps should increase, so be sure to check with your favourite casino to see how they make their casinos software available for mobile. Chances are, they have already released a specialized app or have a mobile version of their software available via a web browser. There are a couple of ways to play blackjack for free. First, players are often welcome to access the "freebie" version of any online casino's software. It's a great idea for players to take advantage of the free play option before diving in for real money so they can get used to the UI and avoid user-initiated mistakes for fake money instead of when it's the real thing. Aside from this free option, players are sometimes given welcome bonuses that make playing optimal blackjack not just free, but a guaranteed profit. Finally, there are times online casinos run a promotion giving players free "casino only" chips to wager with that proxy as free money to wager when playing blackjack games. No, you do not "have" to download software, thanks to many casinos offering "No Download" options of their casino software. These work via a modern browser, such as FireFox or Chrome, and load up almost identically to their native application counterparts. For many players, a No Download option is a must because they do not wish to leave a "gambling footprint" on the computer they use to gamble. This option also makes it convenient for travelers who are not tied to a specific computer to log into their online casino of choice. Can I Play With a Live Dealer? Yes! One of the great innovations in the last year with online gambling is the advent of live dealers. Thanks to massive improvements in streaming video technologies, upgrades in casino software and the rise of broadband speeds in homes, players can get live dealers when the log into online casinos. Typically these dealers are highly interactive and respond verbally when players decide to chat with them. The only negative to playing with a live dealer is that hands might go a little slower to accommodate all the players, and the limits tend to be (understandable so) a little higher than normal. How can I start playing for real money? It’s easy to begin playing blackjack for real money. After joining an online casino, make a deposit and select the type of blackjack you’d like to play. Once the game has loaded, make your wager and start the game. Each hand will be dealt separately, and you may adjust your wagering at anytime between hands. Online blackjack games are not rigged. At least a vast majority of them are not. A random number generator (RNG) controls the outcomes of online casino games. The RNG determines, in a totally arbitrary fashion, what cards will be dealt. If you are concerned about whether or not an online gaming site is trustworthy, make sure that the casino is licensed and that it has its games tested by an independent company on a regular basis. Also, using search engines, research reviews and possible complaints about the site. Yes, it can if players utilize solid blackjack strategy. With online blackjack, just like blackjack at a land-based casino, players using sound money management techniques and making the right choices regarding standing, hitting, splitting, and doubling down can beat blackjack. If you can, over time and utilizing solid money management and playing techniques, develop consistency for making smart choices at the blackjack table, you can make money. However, along with being limited by their knowledge of the game and their ability to make smart choices, blackjack players are limited by their bankroll. As an example, if you want to make $1,000 per month playing blackjack, you’ll need a sizeable bankroll with which to start. If you can make an average of 10% per session and you play 30 days per month, you’ll require a minimum of $4,000. That’s based on very consistent play, and it leaves little room for those times when you can’t seem to win a hand. On average, a player can expect to win 48% of their blackjack hands. Of those wins, a player gets blackjack once every 21 times. That’s where players make their cash, earning 3-2. Thus, if you play 200 hands at $1.00 per hand, on average you’ll hit 10 blackjacks. That would result in a 10% or $2.00 profit. Players can make more by doubling down, splitting, and raising their bet limits and then reducing them at the right times. What should I look for in a trusted site? There are various basic elements to look for in an online casino. First, it should be licensed by a government agency. Also, it needs to perform audits of its games on a regular basis. Most sites will make the results of those audits public. Finally, make sure the casino has a good reputation based on a solid track record for customer service, dependability, and security. 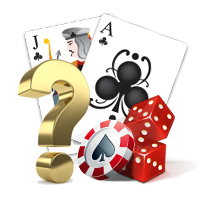 You’ll find many trusted online casinos using the blackjack pages on this site. It’s interesting to note that it’s been found that card counting only affords a player a 1% (one-percent) advantage over the house. However, at a land-based casino where cards are dealt from a shoe and the game goes on fewer cards remain, the player gains a bigger advantage, as they have a better sense as to when they should bet more and when to reduce their bets. This allows them to take advantage of situations when they have a better chance of winning and to, also, reduce losses when it’s more likely they will lose. But, no, if the deck is shuffled after every hand, as is the case at a large percentage of online casinos, you cannot count cards. That’s due to the fact that the reshuffle means that with every hand you are starting with a newly arranged deck, and any counting done on a previous hand is useless. It may be possible to cheat, but it’s highly improbable that one could do so. In order to cheat at online blackjack, one would need to have an inside contact at the casino and that person would have to be able to manipulate the RNG, which is set by the software company that created the game and is very difficult to access and alter in any manner. Does online blackjack shuffle every hand? Yes, at most online casinos, decks are shuffled after every hand, which makes it impossible to engage in card counting. This varies from casino to casino and, sometimes, from table to table. Online casinos are reluctant to tell you how many decks they are using, but on average they utilize six decks. Some use fewer, while others may use up to eight. You will find some casinos that will categorize their blackjack offerings according to the number of decks being used. This gives players some choice and a bit of an advantage. Usually with live dealer blackjack, you cannot simply watch games. Spaces, which are limited to seven, are reserved for players. There’s also no free mode for live games. You must have cash in your account in order to access a live dealer game. Playing online blackjack from the comfort of your home, safely and legally, is a no brainer for all players. Given that there are multiple online casinos available to Canadians that have been fully audited by our staff, each offering crazy welcome bonuses, it seems silly that a blackjack player would choose any alternative. Gambling online is great fun in moderation, though we understand that gambling can be a problem. For a wealth of information, we recommend visiting problemgambling.ca.